How Can Professional And Reliable Furniture Movers in Canberra Make Your Moving Job Less Stressful? While moving to a new house local or interstate, none is more taxing than moving your bulky and heavy furniture such as Beds, Tables, Wardrobes, and Dressers. Furniture removal can be a strenuous and daunting job as it may require a number of considerations before moving it to another place. Even with the help of your friend or neighbor, it can be difficult for you to lift a bulky furniture item and move it around tight corners and up-stairs. So, you need to ensure that there is enough space in your new home so that each piece of furniture remain protected from any damage or scratch during the move. In such a situation, you will never feel regretful on hiring professional furniture movers in Canberra who have the expertise to make your furniture moving job considerably less stressful. Moreover, they can help you save enough time, energy, and money after successful completion of moving job. Skilled and experienced furniture movers in Canberra carefully measure each and every piece of your bulky or large furniture products to position them in the new space properly as per your instructions. To make the measuring process quick and efficient, they can also make use of a variety of available computer programs. This is the most time-consuming process as it involves dissembling of all bulky furniture items like the removal of tabletops, legs, and arms. You can save your time and money just by dissembling all bulky and fragile furniture items before the moving day. Try to keep similar pieces in different plastic bags and also store small screws and hardware items in the labeled sandwich bags. The professional and skilled furniture movers Canberra have special expertise to lift heavy pieces of furniture that can be otherwise dangerous if you try to attempt it by yourself. Moreover, it may take considerably more time to perform this task alone. 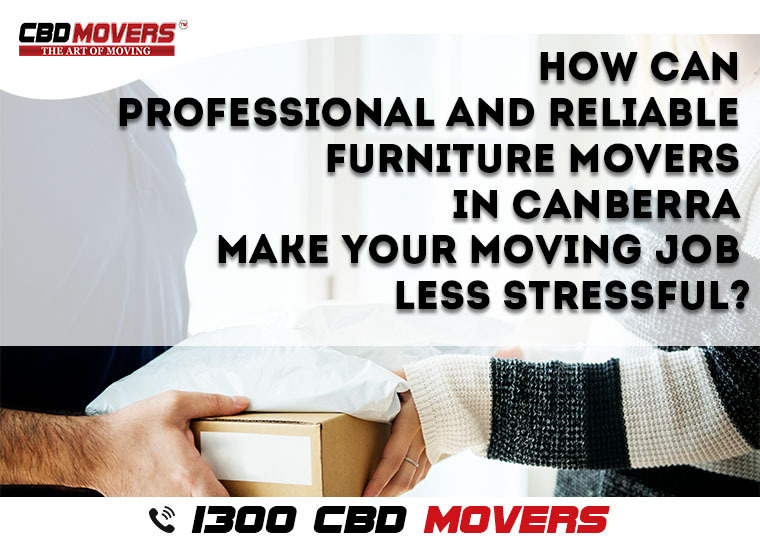 Many professional and reliable furniture movers in Canberra adopt special tricks to move large pieces of furniture such as bed springs or sofas. They more often tilt the piece vertically to minimize the effective horizontal length that allows them to maneuver it through the doorways and around the corners more easily. Your ideal movers Canberra will move and position each piece to its respective room as they had planned earlier. Finally, they will reassemble all your furniture items and also replace all its accessories like cushions and pillows removed from packings. Next PostNext A happy customer Andrew, Deer Park, VIC is sharing his moving experience from CBD Movers™.